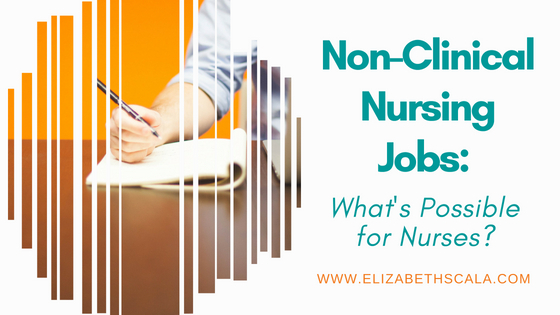 Non-Clinical Nursing Jobs: What’s Possible for Nurses? Nursing is a tough profession. While most nurses LOVE the care that they are able to provide for their patients, many nurses are searching for that non-clinical nursing job. And I don’t blame them! However, before you take the leap from the bedside, I want you to consider the plunge that you are about to take. Truth be told, non-clinical nursing jobs can be just as difficult… if not more so! Trust me, as a nurse who has gone into business for herself, I know just how challenging it can be to become a nurse entrepreneur. While I continue to work in a non-clinical nursing job myself, I can tell you that over time I have learned a lot. In fact, that is one of the things that will make your transition from beyond the bedside a bit more bearable. You need to ask for and be open to receiving help. Whether in the form of a coach, an online forum, a networking group, or even watching a tutorial online… you cannot bypass the fact that you may not know everything about setting up a business online. One of the great things about wanting to get into a non-clinical nursing job is that there are plenty of nurses who have done the same before you. In fact, there are so many nurses in business that there is a national organization called the National Nurses in Business Association (NNBA). In addition to signing up for a formal membership with a professional organization such as the NNBA, you will also want to grow your network online in other ways. Remember- one of the things about being in business for yourself is that you will have to generate revenue. At the end of the day, without money coming in, you don’t have a business after all. There IS Going to Be Work to Do! Moving from a clinical to a non-clinical nursing job doesn’t mean that you won’t be working hard. In fact, at the start of your online business, you may find yourself working JUST as hard… only in some different ways. Well, yes. And no. The work in non-clinical nursing jobs is different. The autonomy is wonderful. And the reward can be handsome. However, if you think that you are going to get into a non-clinical nursing job and not have to work… you are going to be sadly mistaken. I don’t know ONE business owner who doesn’t have to work for their pay. And, since the work is different, it can be so much fun! In fact, I do believe that when my hubby came to ask me that question several years ago… the reason that I was working SO much was because I LOVED what I was working on! Get Started with Your Non-Clinical Nursing Job Today! If you’ve been thinking about the next shift in your nursing career– here’s your chance to make it happen! Take the first step and explore non-clinical nursing jobs for the nurse entrepreneur. Tell her I sent you and enjoy this next chapter in your nursing career. I agree many who venture out on their own underestimate the time commitment needed. I really don’t think enough nurses know there is an opportunity outside of the bedside. All of our formal training is so geared towards bedside nursing I was surprised to discover the many opportunities. For example becoming a nurse entrepreneur was something that was not mentioned during my training and I only recently discovered that it was a thing.